Optional 2007 pre-emission control 600HP Cummins ISX Engine, Allison 4000 Transmission,Car Fax available, sleeps 6, Build Sheet -$690,665. Looks brand new inside/out & always stored indoors, NO Smoking & NO Pets, Transferable Good Sams extended bumper-to-bumper warranty, all Maintenance up to date with recent pre-delivery Inspection, window awnings and passenger side full awnings, 4 new 8D AGM house & 2 new engine batteries, 2013 front tires/2015 rear tires, This coach looks as new as that New $400,000 Winnebago Tour or Thor Tuscany you have seen at the RV Show or dealer, except for the fact that it would cost nearly $1,000,000.00 to have a brand new coach like this at today's over inflated prices. This coach is equipped similar to a 2012 or later Newmar King Aire. Save yourself the money and the hassle of being the First Owner of Brand New Luxury Motorhome. Everything Works! Come see this masterpiece for yourself. You will be Glad you did. 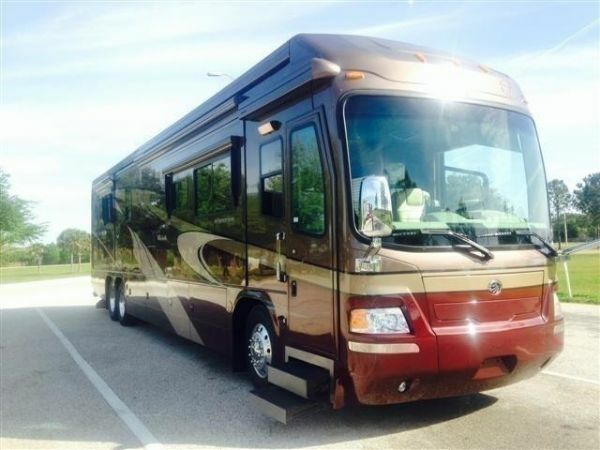 Plus $80,000 options package: 2007 Cummins ISX 600 HP engine $21,861, glass vanity sinks-$1,988 Stained solid Cherry Wood raised panel doors/cabinets/ trim -$7,754 Dual air & hydraulic leveling -$4,839 Girard automatic patio and window awnings throughout $10, 211, 2 powered Bay Storage slide-out trays $2,310 Interior sun screens- $350 Full leather ensemble package- $7,511, Full Italian marble in Living Area- $1,050, Residential Refrigerator/freezer with Extra new AGM Battery- $2,044, Microwave/convection oven- $546, Eaton Vorad collision avoidance system- $8,050, Deluxe dishwasher Drawer- $1,407, Maytag stacked Washer Dryer- $2,063, Central vacuum System-$385, King mattress- $140, Sirius satellite radio-$280, Bed Room Bose System- $525, CB radio $266, 3rd GPS Nav.System/screen for Co-Pilot's seat- $2,002, Deluxe Viper security system, See-Vision Security 4 color Camera System, Aqua-Hot Hydronic Coach and endless water heating System, new WingardRT4000T in-motion satellite system, Bose home theater system throughout w/2 DVD player AM/FM Pioneer in-dash w/CD, 5-color painted exterior graphics with fades, Baggage door power locks, Dual pane windows, Powered drivers window, Powered sun-visors & window shades in the cockpit, Powered Louver Shades in the Front Salon, key-less remote entry, 2 Stage Jacobs engine brake, Auto-traction w/snow crawl mode, Anti-lock disc brakes, 10,000 lb hitch and Brake Controller, 270 amp alternator, 12.5 KW Onan Quiet-Diesel, Temperature controlled auto. generator/ac start switch, TRIPLE head 3 way powered and heated mirrors w/side cameras, Aladdin Video Coach Monitoring system with 3 LCD monitors in pilot & co-pilot's seat & bedroom, 2800 Watt pure sine inverter Solar battery charging system and more! NADA Guide Ave. Retail-$392,400/Low Retail-$325,700. NADA Wholesale-$300,000.Wayne. 913-548-2894.